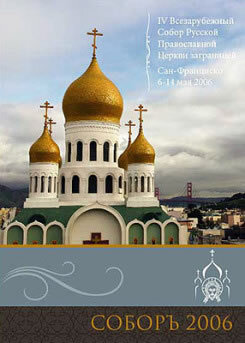 St Tikhon Orthodox Humanitarian University in Moscow hosted the showing of a documentary, “Sobor 2006,” on the historic 4th All-Diaspora Council of the Russian Orthodox Church Outside of Russia held in San Francisco in May, 2006. Present was Protopriest Peter Perekrestov, Senior Priest of the Cathedral of the Mother of God “Joy of All Who Sorrow” in San Francisco and Senior Secretary of that Council; Protopriest Vladimir Vorobiev, Rector of St Tikhon’s; Priest Georgy Orekhanov, Prorector of International Efforts; teachers and students of the University and other guests. The showing of this film continues the celebration of the fifth anniversary of the signing of the Act of Canonical Communion between the Russian Orthodox Church and the Russian Orthodox Church Outside of Russia in 2007. Fr Peter preceded the screening with a brief history of the All-Diaspora Councils. Over the history of the Russian Church Abroad, there were only four such assemblies, which included the participation of bishops, clergymen and laity, representatives of all dioceses and various social organizations. The first one was held in 1921 in Sremsky Karlovci, Yugoslavia, at which Metropolitan Anthony (Khrapovitsky) presided. That council was convened to organize the Russian Church Abroad. The second All-Diaspora Council convened in 1938, also in Sremsky Karlovci, and was headed by the second First Hierarch of the Russian Orthodox Church Outside of Russia, Metropolitan Anastassy (Gribanovsky). 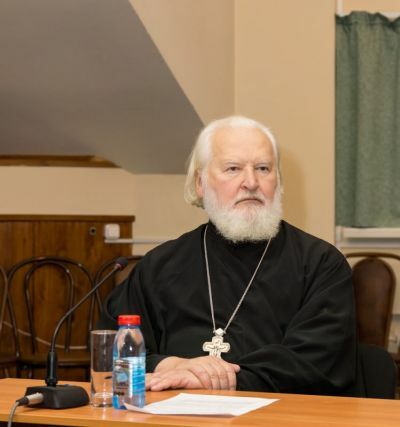 Topics under discussion included the strengthening of the ecclesiastical organization of the Russian Church Abroad and the spiritual ministry of the Russian emigration. The Third All-Diaspora Council was held in Holy Trinity Monastery in Jordanville, NY, in 1974, and headed by the third Primate of ROCOR, Metropolitan Philaret (Voznesensky). Fr Peter told the fascinating story of how Metropolitan Philaret was elected First Hierarch. At the Council of Bishops of 1964, at which the successive Primate was to be elected, two candidates, Archbishop Nikon (Rklitsky) and St John (Maximovich) received an equal number of votes in the first round. When they tied during the second and third rounds, too, St John agreed to remove his candidacy in favor of the youngest of the hierarchs (by date of consecration), Bishop Philaret of Brisbane, Australia. As a result, he was unanimously elected First Hierarch of the Russian Orthodox Church Outside of Russia. The final, 4th All-Diaspora Council faced the decision on reestablishing unity within the Russian Orthodox Church. Fr Peter noted the importance of the city of San Francisco having been chosen as the site for this assembly, since it had once been the cathedra of St Tikhon, who later became the Patriarch of All Russia. “Sobor 2006” documented the progress of the 4th All-Diaspora Council. Nicholas Sherman, the Australian director of the film, was able to convey the mood, atmosphere, the anxieties shared by the participants of the gathering. The films shows the opening of the Council, the divine ceremonies, the akathist service before the Hodigitria, the Protectress, of the Russian Diaspora, the Kursk-Root Icon of the Mother of God “of the Sign,” as well as footage of the meetings themselves. The audience was shown how topics were deliberated, the reasoning and arguments of proponents and opponents of reunification. The film included rare film footage of the exodus of the White Army from Russia, the destruction of churches, divine services celebrated by Holy Patriarch Tikhon, and never-before-seen footage of St John (Maximovich). At the end of the viewing, Fr Vladimir thanked Fr Peter for showing this unique film, and noted that it conveys the sense of love, faith, truth, the pain of separation, the sorrow over the loss of unity and the joy of its reestablishment. In the opinion of Fr Vladimir, the signing of the Act of Canonical Communion by His Holiness Patriarch Alexy II and His Eminence Metropolitan Laurus was the pinnacle of their careers. It was a victory not only for the two hierarchs, but for the entire Church, for all of Orthodox Christianity. “The Body of Christ is whole. Divisiveness is painful for both sides. What we saw today was that this council was a great accomplishment, in which love prevailed, faith was victorious,” concluded Fr Vladimir. Fr Peter then answered questions, noting that the Russian Orthodox Church Outside of Russia always considered itself the free voice of the Russian Orthodox Church. When Russia was wracked by persecution, the Church Abroad was able to explain to the world what was happening. The Church Abroad was also able to canonize the saints who were not yet recognized in Russia, for instance, St John of Kronstadt, the Royal Family and New Martyrs of Russia. Before 1927, the Russian Church was one. The division occurred that year upon the issuance of the declaration of Metropolitan Sergius (Stragorodsky). 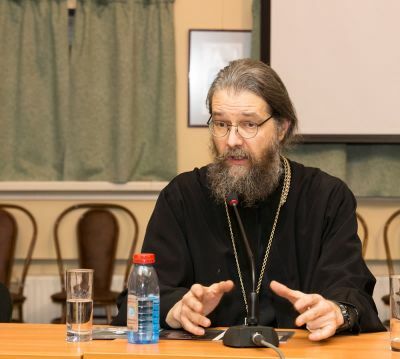 Many hierarchs within Russia ceased to commemorate Metropolitan Sergius and openly criticized his position—Metropolitan Kirill (Smirnov), Archbishop Feodor (Pozdeevsky), Bishop Seraphim (Zvezdinsky), Bishop Afanasy (Sakharov), and others. Until 2007, joint celebration of divine services was prohibited between clergymen of the Russian Orthodox Church Outside of Russia and Moscow Patriarchate. This prohibition did not extend to the laity, but the situation was painful for both parts of the Russian Church. Reactions to the decision of the council varied from diocese to diocese. Many parishes in Argentina, Brazil and other countries of South America did not accept this decision and departed into schism. Today, according to statistics cited by Fr Peter, there are eight schismatic groups which are themselves separated by enmity. These groups often have more bishops and priests than parishioners. Discussing the possible motives for schism, Fr Peter noted that many parishes, especially in South America, lived in isolation for many years, and had no archpastoral care. Many laypersons, witnessing the internal squabbling of the schismatics, simply stopped attending church altogether. There are also those who have returned to the Church. According to Fr Peter, there was never an instance of such reunification in the history of the Church. There had been instances of schismatics returning to the Church, and rites exist to reunite those who had once fallen away. This, however, was a case of two parts of the Russian Church being in separation. One was large, the other small. Fr Peter likened the reunification of the two parts of the Russian Church with the mystery of matrimony: “This was like a wealthy bride and a poor husband. Before the altar, they are equal, both husband and wife. The act of reunification is a real mystery: something unseen passes through the visible. This is like the mystery of marriage—two parts unite and become one flesh.” Fr Peter also stressed that when a couple unites in marriage, they begin to learn from each other. After this act of reunification into a single Russian Church, both joys and sorrows await both, disappointments and triumphs, which should not cause any alarm. Fr Vladimir ended the event by emphasizing the importance of establishing friendly relations, visits, contact with the brethren of the Church Abroad, which will bring great benefit to both sides. Fr Vladimir drew attention to the atmosphere of love in which the Sobor of 2006 was held, the warmth and mutual respect between the clergy and bishops. “The results of persecution will still be apparent for a long time. They tortured and mutilated our souls. In order to recover, we must have close contact with our dear friends, our kin in faith in the Church Abroad,” said Fr Vladimir. As a symbol of warmth and friendship towards St Tikhon University, Fr Peter gave its library a very valuable book—the published Acts of the 4th All-Diaspora Council of the Russian Orthodox Church Outside of Russia, and also a copy of the documentary.